I am pleased to introduce you to another fabulous jewelry shop, Kawartha Beads. And guess what- April, the owner, is Canadian and is based only a few hours drive from where I grew up in Ontario! Creative talent runs in her family because April’s mom is also a jewelry designer too and has her own Etsy store called Bijoux Designs for You. Kawartha Beads has such pretty and interesting pieces and I enjoyed browsing through her shop and looking at all the earrings and necklaces. 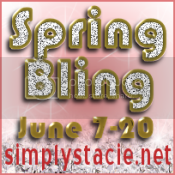 I love the delicate and feminine look of this handmade jewelry as well as the excellent prices. For all you bookworms like me, you can even get a pretty bookmark to mark your pages. That beats a piece of kleenex or ripped envelope any day! 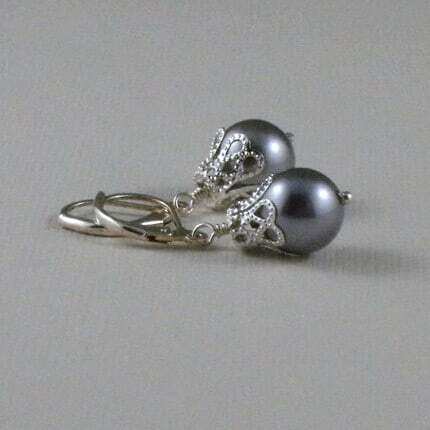 April sent me a pair of earring to review- Lavender and Lace Earrings. 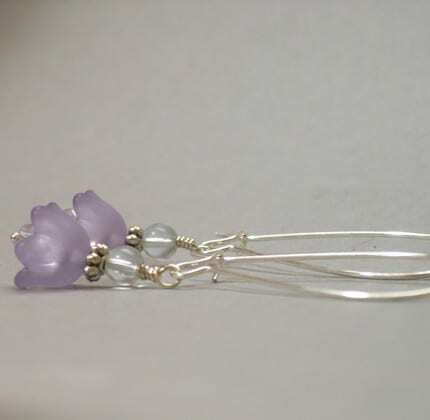 They have a lavender glass pearl topped with a lacy silver bead cap and are truly beautiful. I love that they are small and simple, yet big on adding a beautiful addition to your look. The colour of the pearl is very intriguing. It is like a purplish gray with a metallic tone. I love wearing mine. And at a cost of only $8 and FREE shipping in US & Canada, you can’t go wrong. They are WELL WORTH it and an awesome buy either for yourself or as a gift for a friend or loved one. Visit Kawartha Beads and see April’s other gorgeous jewelry designs and place your order today! I like the Ode to Spring Charm Bracelet, too. Thanks for the chance to win! I looked at their website and also like their stunning sapphire earrings.